After last month's club, I felt like we should get back to some old-fashion stamping. I think you will like this one, especially the color scheme of 2014-16 Lost Lagoon, Calypso Coral, and Crumb Cake. Polka Dot Pieces Stamp Set (AC p. 139) is a great combo stamp set that includes images that coordinates with Stampin' Up! punches, like several scallop circle punches, 1 3/4" and 1 1/4" (flowers, easy), the Elegant Butterfly Punch (makes butterflies, easy peasy), and the Bird Builder Punch (makes the bird, real cute too). The flower is built on a layer of Very Vanilla card stock, then a layer of Lost Lagoon card stock trimmed with the scalloped edge punch, a layer of Crumb Cake card stock trimmed with the scalloped edge punch, and adhered to a card base of Very Vanilla card stock, again, trimmed with the scalloped edge punch. 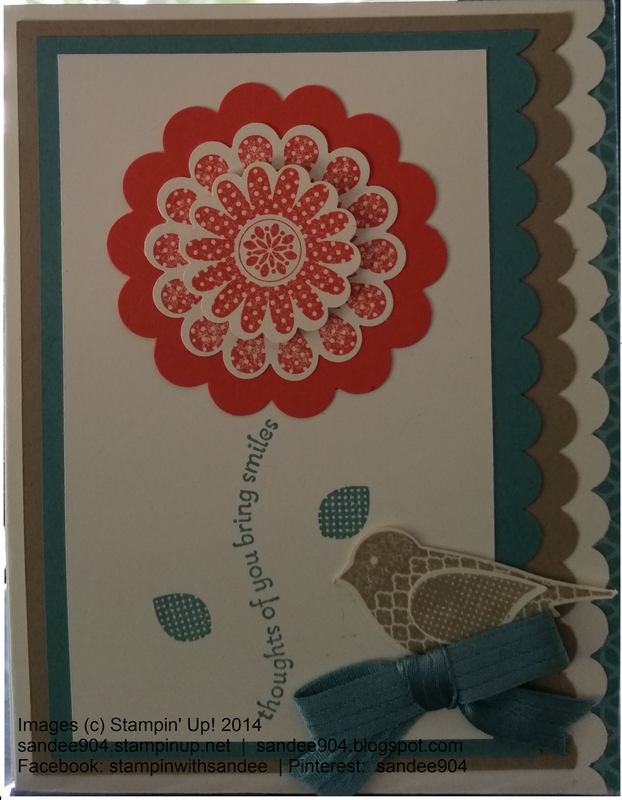 It is not very clear in this photograph, but with the front of the card trimmed with the scalloped edge punch, the inside of the card shows through and is trimmed with a piece of coordinating Flowerpot Designer Series Paper. Finishing touch in the bottom right corner is the coordinating ribbon --- 3/8" Stitched Satin Ribbon in Lost Lagoon. Let me know how you like this card. If you need any of the supplies to make this card, I would appreciate it if you would select me as your Stampin' Up! demonstrator. Visit my online store at sandee904.stampinup.net.